Stephen Riley Photography: Somerset: 17 July 2011 What happened to the colour purple? 17 July 2011 What happened to the colour purple? I am currently preparing work for the Lomo Wall Project, which will take place at the Mount Pleasant Media Workshop in Southampton in October (closing date for submissions 22 Sept 2011 – all welcome). The idea is that those who care to submit Lomo or Lomo-style photos themed by colour. A giant rainbow-like work will then be assembled from everyone’s submissions. I chose purple. Not an easy one, I know. I loaded up a film into an old 35 mm point-and-shoot camera and set off. In two hours of searching I found 2 purple things: a dustbin and a bike. There were things that were nearly purple: things that might have categorised more as, perhaps, mauve, lilac, violet, lavender or magenta, or maybe maroon – or is that the same as mauve…? But I saw very little of what one might think of as full-blown purple, and after a while I started to question my own judgment and wonder what purple actually looked like; how it was distinguished from say, a violet or a mauve; where one thing finished and another started. I blame Lawrence Llewellyn Bowen. He made purple fashionable very briefly and in certain quarters in the 1990s. As a consequence, it wasn’t fashionable in any other quarters around at the time and evidently hasn’t been with anyone who has come to maturity since. I’m sure its time will come again. But will my roll of film expired before that happens? 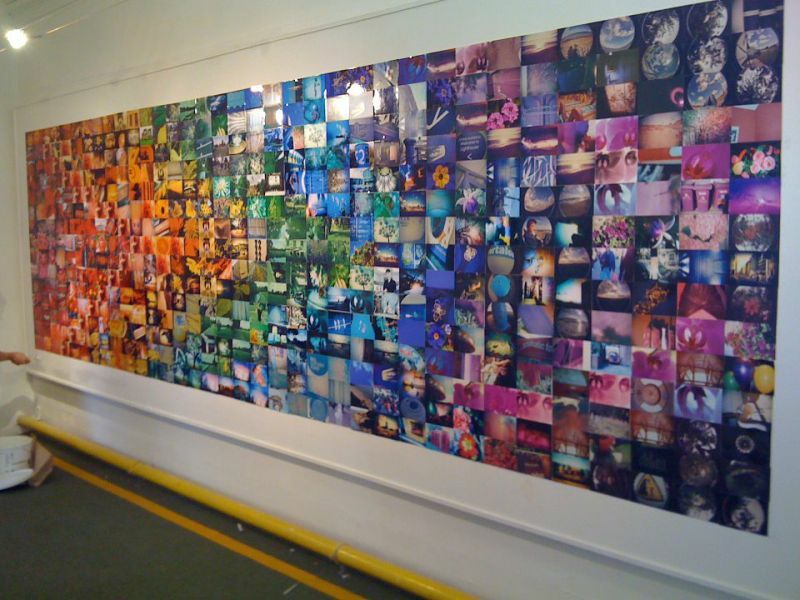 Lomo Wall - collaborative photo-work. Photo by Stephen Riley.